After seeing Whitley Bay Birder's post about the Short-Eared Owl he saw opposite Simonside Way, Killingworth, I decided to have a bike down. I got there about 15:40 and began walking down the Wagonway towards Holystone. First birds of interest were a large flock 50+ strong of Linnets, Whitley Bay Birder said he seen the SEO at 17-17:30ish at the top field near the road, as I was early I walked further down the field. When a reached the bottom field with a bit of a flash a saw my first glimpse of the SEO, I repositioned to get out of sight, soon as I did this a noticed a dog walker coming up the track, straight past the SEO, which was to busy hunting to care. 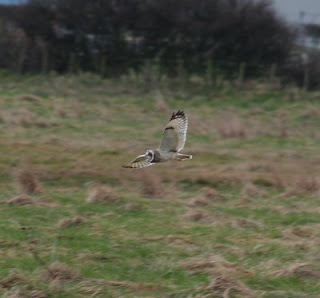 The hunting style of the SEO is pleasant to watch, yet effective in providing dinner. The way the bird quaters back and forth, hovers and then suddenly folds its wings backward almost like a Gannet, and hits the deck. I watched the bird for 15 minutes, it had numerous dives but didn't make a kill. There's a track on the opposite side of the field, close to were the SEO was, looked well covered and perfect for a photo opportunity, as I crossed the field a 2nd SEO was put up.